The Rockhouse is a unique accommodation, lovingly built by Reg from rocks gathered on the farm. The more intimate of the two cottages, it offers comfortable, tastefully decorated accommodation,ideal for couples or a family. Quality linen supplied. 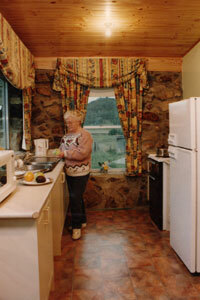 • Galley kitchen with full size stove,microwave and kitchenware.